. 天神菅原道真伝説 Legends about Tenjin Sama . I wish to color my cheek with it." He went on to serve the Emperor as a trusted Minister of the Right, until he fell into disfavor and was exiled to Dazaifu, where he was known as Dazai Gonnosochi. Two years of his exile were spent at Enokisha (Enoki Shrine) about three kilometers west of Dazaifu Tenmangu. He died in the spring of 903, aged 59. 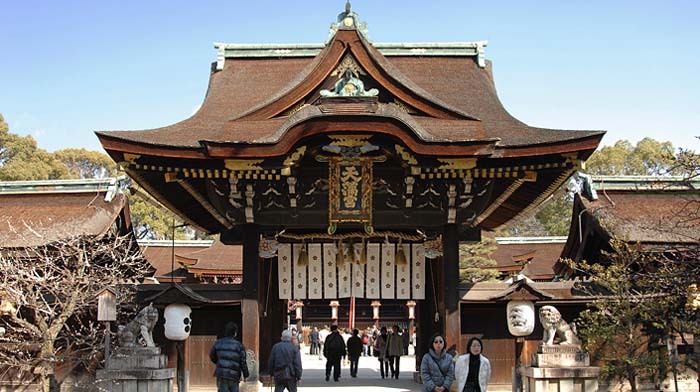 The construction of the main shrine above his final resting place marked the beginning of Dazaifu Tenmangu. 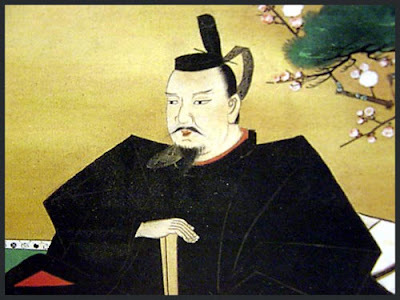 The life story of Michizane is one of court intrigues, infighting and exile. His restless soul became a revengeful ghost spirit (goryoo, onryoo), of which I will tell you more below. He is also known for his love of the plum blossom and left many poems about the plum. To appease his revengeful sould, the great shrine at Dazaifu was erected. The Dazaifu Tenmangu is the first and most important of several hundreds of shrines built all over Japan and dedicated to the spirits of Sugawara Michizane, an influential scholar and politician of the Heian Period, who has been identified with Tenjin, the kami ("Shinto god") of education. His shrines are now visited by thousands of students before an examination to pray for success. Since Michizane made the long journey from Kyoto to Dazaifu without encountering difficulties, he has also come to be revered as a protecting god of travel and traffic safety. The bullfinch (uso) is believed to be Tenjin-sama's messenger. Dazaifu Tenmangu is a shrine built over the grave of Michizane Sugawara venerated by the Japanese throughout the country as the Tenman-Tenjin (the deified spirit of Michizane), or the God of literature or calligraphy. 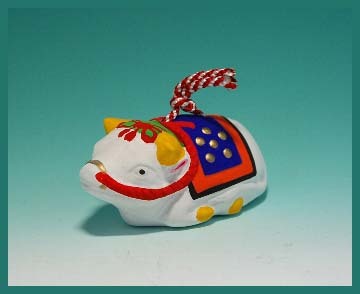 the ox suddenly came to a halt (ushi 牛 ox, bull cow) and refused to budge despite threats and entreaties. The burial therefore took place on the spot, and this became the site of the Tenmangu's main shrine visited today by so many admirers.
. Statue of the ox　(ushi) at Yushima Tenmangu . In early January each year, TOBIUME is always the very first tree to blossom, and the thousands of other trees quickly follow, producing an incredible sight when the Tenmangu is covered in small pink and white flowers. In 901 AD Michizane Sugawara the Udai-jin (the Right Side Minister) was demoted to Dazaifu because of a false report circulated by Tokihira Fujiwara the Sa-daijin (the Left Side Minister) . When Michizane Sugawara walked to Chikushi from Heian-kyo, it was a lovely spring day. Many of his subordinates gathered to say good bye to him and some asked him to take them with him. His party left Heian-kyo together. Michizane Sugawara and his subordinates were very unhappy, One of his subordinates said to the rest that they cannot be unhappy forever and that they would have to do something to cheer him up. All his subordinates aroused themselves. When the party crossed the Katsura River and reached Terako, Michizane Sugawara found that a kilometer ahead the cherry trees in bloom in Nishi no oka. He decided in his mind, 'I am going to say good-bye to Kyoto completely at that place.' On the hill, more than one hundred gorgeous cherry trees were in bloom and cherry blossom seemed to completely cover the sky. He stopped and stared through the dropping flowers to the capital of Kyoto. His subordinates guessed Michizane Sugawara's feelings and they all cried for him. The people who were living in the village where Michizane Sugawara's party stopped also cried for him. After Michizane Sugawara left the villagers felt sorry for him because he did not want to leave Kyoto. They decided to build Tenmangu to pass his knowledge to the children. It is called 'Chiyozakura Tenmangu' and the cherry is called 'Tenjin no sakura (Tenjin cherry)'. When the flowers start to drop they always blow on the wind to the south towards Kyoto because of Michizane Sugawara's feelings. Another famous shrine was build in Kyoto itself, to appease the vengeful soul, since many disasters had befallen the city after the death of Michizane. This shrine enshrines Michizane Sugawara , who because of his great learning during his lifetime is worshipped as the patron of learning. 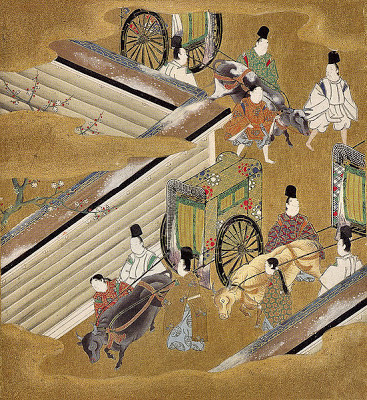 Michizane was first especially favored by Emperor Uda, who bestowed great trust in governmental affairs upon him. But later he was exiled to Kyushu because of slander and died in exile in 903. After his death, severe earth-quakes and thunderstorms did constant damage in the home provinces, and it was thought commonly that these were the result of his wrath. 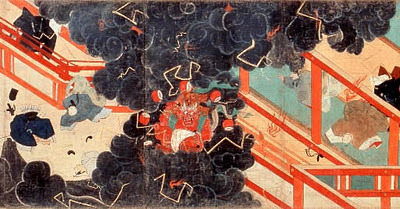 The Imperial Court granted him the post-humous title of Karai TenJin, or God of Fire and Thunder ; because of the increasingly large number of his slanderers and their families who met with unexpected disaster, his power was more and more feared by the Court and the common people. The process of divinization of Michizane was greatly assisted by sympathy with his misfortune of having died in exile,by admiration for his unchanging spirit of loyal service,by the mute judgment of the masses against their rulers,and by the social unrest caused by the ever-continuing disasters. Because of the prophe-cies spoken in 942 by Tajihi-no-Ayako, who lived in Nishi-no-kyo Shichijo, and in 947 by Taro-maru, a child of Hirano Yoshitane of Omi,a shrine was built in the present location and was known as Tenman Tenjin. In 959, the Udaijin (Minister of the Right) Fujiwara-no-Morosuke enlarged the buildings. On the fifth day of the eighth month of 987, the Kitano-matsuri was celebrated for the first time ; this festival continues to the present day. visits, and the regents, shoguns, and common people of all ages since have paid it extraordinary reverence. Its annual festival is August 4, and there are also very many special rites connected with literary pursuits and agriculture. A part of the present Honden, or Main Shrine, was built in 1607 by Toyotomi Hideyori. Both the Honden and Haiden have the irimoya-zukri style of roof, and there is a stone room between the two buildings. To the West and East of the Haiden are Gaku-no-ma, or Music Chambers' ; the roofs of these bulldlngs are all united Into one roof this style of architecture is called yatsu-mune-zukuri or gongen-zukuri. The buildings are designated as important cultural properties, and are representative examples of Momoyama architecture. The many plum trees in the shrine precincts are due to the fact that Michizane was fond of plum trees in his lifetime. Also known as the Middle Gate, the Sanko Gate is an important cultural property said to have been constructed by Toyotomi Hideyori in 1607. There is a plaque on the gate attributed to the Emperor Gosai, and it is said that the gate got its name from three lights inscribed in the woodwork, representing the Sun, the Moon and a Star ("Sanko" literally means "three lights" in Japanese). Another explanation has it that there is no star inscribed. This explanation is based on the story that in the Heian Period, when the Emperor prayed to the shrine in the north from the Daidaiiri Hall, the North Star was shining right over the Sanko Gate, so it was not inscribed in the gate itself. If you go deeper into the shrine grounds through the Sanko Gate and the middle garden, you will see the Entrance Hall and the Main Hall of the shrine, where Michizane is enshrined. It is said that in 1607, Toyotomi Hideyori's father, Toyotomi Hideyoshi, left his son with a last wish, and thus he used the Main Hall building as his official office. The structure is a national treasure representing the imposing and gorgeous Momoyama Period culture with its characteristic "Hiwadabuki" style cypress bark roof, covering an amazing 1,650 m2. The Gate of three lights without the Star!
. Hatsu Tenjin 初天神 First visit to a Tenjin Shrine . "Linked verse with white backside" . Children living nearby may come and practise their first brushstrokes in the hall and along the corridor. With a prayer to become a skillful calligrapher.
. fude hajime 筆始（ふではじめ）first use of the brush . Yellow rapeseed blossoms are offered to the deity. Michizane offered them when there were no plum blossons at this time of year. Lately plum blossoms are also offered. Many stalls along the river Kamiyagawa 紙屋川 sell food and drink, but sometimes it snows on this day.
. Rapeseed blossoms (na no hana, nanohana 菜の花) . omukae ningyoo 御迎人形（おむかえにんぎょう）"welcoming the dolls"
The 14 dolls of famous people are quite old, dating from 1690. They are usually kept as treasures in the shrine. Among the various festivals in Osaka, Tenjin Matsuri Festival in Osaka is the most colorful representative summer festival of the region. The Tenjin Matsuri Festival in Osaka is one of Japan's three major festivals with the other duo being the Kanda Matsuri in Tokyo and the Gion Matsuri in Kyoto. Tenjin Matsuri Festival in Osaka is also the world's greatest boat festival. It is held annually from July 24th to July 25th. The origins of Tenjin Matsuri Festival in Osaka can be traced back to a festival in the Osaka - Tenman-gu Shrine . During Tenman-gu Shrine local people first flew a halberd as part of a purification ceremony from Shato no Hama. Tenjin Matsuri Festival in Osaka began in 951. Tenjin Matsuri Festival in Osaka also celebrates Tenjin, the deification of courtier and scholar-poet Sugawara Michizane (845-903 AD), who fell victim of political intrigue and died bitterly in exile. During the Edo Period when Osaka was considered the marketplace of Japan, Tenjin Matsuri Festival in Osaka became the main summer event in the Water Metropolis, and remains so today. With the passage of time however, Tenjin Matsuri Festival in Osaka has now become an event synonymous with Osaka, the Japanese city of water. Tenjin Matsuri Festival in Osaka is held to drive out the evil sprits of summer and as a requiem for the soul of Sugawara-no-Michizane, a leading Court scholar of the Heian era (AD 794 - 1185). Tenjin Matsuri Festival in Osaka has been celebrated for over 1000 years. A variety of events are organized as part of the Tenjin Matsuri Festival in Osaka . This is one festival you do not want to miss! •Traditional Japanese performing arts such as kagura music (performed when paying homage to gods) and bunraku theatrical performances using puppets are performed in all parts of the city. •A land procession, which is a parade of some 3,000 people dressed in the imperial-court style of the 8th-12th Centuries marching beside portable shrines also takes place. •There is a boat procession, when the same 3,000 people board some 100 boats from the approach of the Tenmabashi Bridge and sail upstream. •At dusk, the boats are lit up with fires. They are ignited to illuminate the surroundings for patrolling or fishing. They are reflected on the river surface, creating an exquisite view. •Pavilions are set up on the riverbanks. The citizens and tourists enjoy the cool evening air as they cheer at the Tenjin Matsuri Hono Hanabi fireworks display taking place at the same time. •The ceremony closes with the Osaka-style handclapping when the crowd of 3,000 returns to the Tenman Shrine. The rhythmical handclaps and shouts evoke an air of the ideal Osaka iki (stylish and charming) lifestyle held by the townspeople in the Edo Period; which is quite distinct from Tokyo-style iki.
. Haiku Poet Yoshiwake Tairo 吉分大魯 .
. shiraume ya kitano no chaya ni sumaitori . Yosa Buson visiting Kitano Tenmangu 北野天満宮 - Kyoto . Deceased individuals are sometimes deified and thereafter worshipped as Tenjin (lit. "heavenly spirit" or "heavenly god"). Shrines devoted to Michizane Sugawara 菅原道真 (845 - 903 AD) and to Emperor Meiji 明治天皇 (1852 - 1912 AD) are the two most prominent examples of Tenjin shrines. Michizane (courtier in the Heian period) was deified after death, for his demise was followed shortly by a plague in Kyoto, said to be his revenge for being exiled. 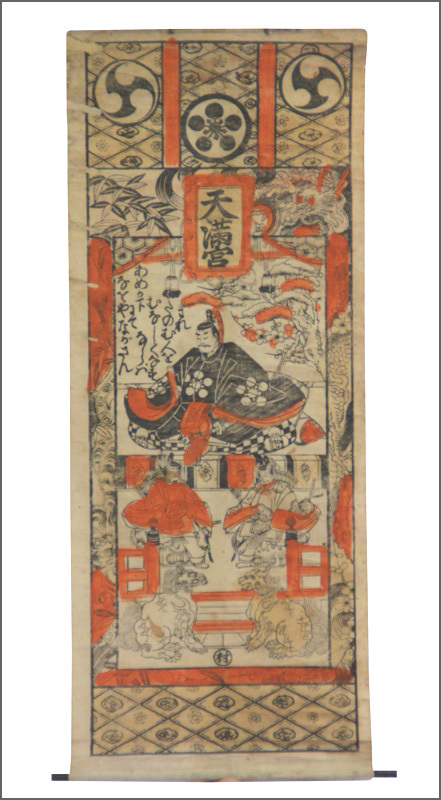 Michizane is the patron deity of scholarship, learning, and calligraphy. 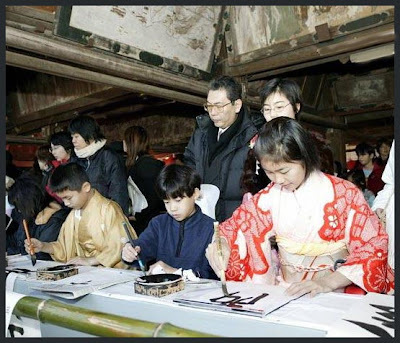 Every year on the 2nd of January, students go to his shrines to ask for help in the tough school entrance exams or to offer their first calligraphy of the year. Egara Tenjin 荏柄天神 (in Kamakura) is one of the three most revered Tenjin Shrines in Japan, and among the three largest. The other two are Dazaifu Tenmangū 大宰府天満宮 (near Fukuoka; Dazaifu is where Michizane was exiled), and Kitano Tenjin 北野天神 in Kyoto (Michizane's birthplace). Of a total of about 90,000 Shinto shrines in Japan, there are about 11,000 Tenjin or Tenmangū shrines (editor: must find source of number). Around January 15 each year, shrine decorations, talismans, and other shrine ornaments used during the local New Year Holidays are gathered together and burned in bonfires. They are typically pilled onto bamboo, tree branches, and straw, and set on fire to wish for good health and a rich harvest in the coming year. At these events, children throw their calligraphy into the bonfires -- and if it flies high into the sky, it means they will become good at calligraphy. One day after the Chrysanthemum festival on September 9 Michizane had been requested by Daigo Tenno 醍醐天皇 to write poems in rememberance of "sad and pittyful things" (shuushi). is an autumn festival that occurs every year from September 21 to 25 in order to seek Sugawara Michizane’s divine virtues and give thanks to the gods for an abundant crop. Beginning in 1101, the festival’s highlight is the Massive Procession that centers around and fans out from a portable shrine in which the gods ride. The portable shrine begins its journey at 8pm on the 22nd and makes its way back starting at 3pm the next day. Shinto priests and volunteers wearing historical clothing slowly proceed along the 2km (1.2 mile) road from Daizfu Tenmangu Shrine to Enoki Shrine 榎社 (formerly Enoki Temple), taking two hours to do so. This scene from a bygone era seems to vividly come to life in the goregous Heiankyo (the former capital, Kyoto) style! Another ceremony is held in which visitors can pray for various favors by burning votive candles lit with a sacred flame around Shinji Pond. When 1,000 candles have been lit with the sacred flame, the shrine maidens perform musical and dance pieces such as Yukyu no Mai performance on the acquatic stage as the candlelight that brightens the still darkness reflects off the surface of the pond, inviting the world of the serious and profound. even though your master is no longer with you. be sure to send me your sweet fragrance. Japanese nobilities those days had a great fondness for plum blossoms and its beauty was widely featured in classical art and poetry. Indeed, Man-yoshu, an anthology of Japanese poetry written in fifth to eighth century, contains 104 poems featuring plum blossoms, as against only 38 for cherry. Because of this tanka, plum trees are like the symbol of Tenjin shrines and almost all of them have the trees planted at their shrine grounds. Here in Egara, a pair of red and white plum trees are standing in front of the main hall; red one on the right and white one on the left. The red one is said to bloom in late January, earliest in Kamakura. Altogether, about 40 plum trees are planted. The first flower-viewing ceremony of the year in Kamakura takes place right here. On the door of the main hall, the Shrine's emblem with five circles appears designed after the ume blossoms. The five circles and lines in center depict round petals and stamens of the flower. As a tribute to the gods. In Japanese religion, they are the vengeful spirits of the dead. 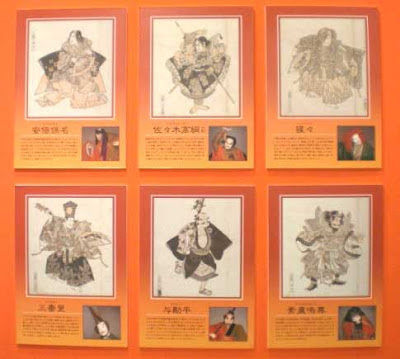 In the Heian period (AD 794–1185) goryo were generally considered to be spirits of nobility who had died as a result of political intrigue and who, because of their ill will for the living, brought about natural disasters, diseases, and wars. The identities of the goryo were determined by divination or necromancy. Here is a long and scholarly essay about these vengeful spirits and the illnesses of humans suffering from their revenge. The spiritual beings that work in order to weaken the immune system so that germs and other harmful agents can break through and cause diseases, can broadly be divided into two distinct categories. On the one hand, there are the spirits with whom one has a direct relationship, on the other hand there are the spirits with whom no such relationship originally exists. Another long essay about the concept of spirits of the dead in different Buddhist sects. Behind this popular practice of the memorial service lies a traditionalbelief in, or fear of, the spirits of the dead, whose presence is stillnear. They are vengeful spirits, who must be soothed by the regularoffering of prayers or by those who have special spiritual power. for the eight vengeful souls, at shrine Goryo Jinja in Kyoto. Here is the information that started my search about Michizane. In the Japan Times this morning, December 15, was an article about the famous Bunraku play. The Tokyo National Theater is currently showing a three-hour bunraku performance drawn from the play "Sugawara Denju Tenarai Kagami" (literally translated as: "Sugawara Certifies a Disowned Disciple to Perpetuate His Line of Calligraphy"), written by Takeda Izumo and collaborators in 1746. "Sugawara Denju Tenarai Kagami" centers on the life of Sugawara Michizane (845-903), and his feud with Fujiwara Shihei. 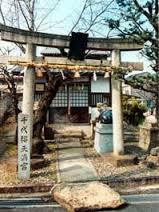 Through the machinations of Shihei, Michizane was exiled to Dazaifu in Kyushu, where he died. This Machiavellian historical tale is also combined with the story of the lives of three triplets, born in Osaka just before the play was written. The three brothers, whose symbolic names are taken from ume (plum) and matsu (pine) and sakura (cherry), trees, have strikingly different characters and appearances. They are all three servants to the courtiers: Umeomaru serves Michizane; Matsuomaru works for Michizane's mortal enemy, Shihei; and Sakuramaru, a humble oxherd, is in the service of Prince Tokiyo, younger brother of the emperor. The political rivalries of their masters lead to passionate rivalry between the brothers. This partial version of the play focuses on the story of Sakuramaru. The play opens with an idyllic outing near the Kamo Shrine in Kyoto. Sakuramaru and his wife, Yae, arrange a meeting between Prince Tokiyo and Michizane's beautiful foster daughter Kariyahime. Kariyahime meets Prince Tokiyo but their assignation is spotted by Minister Shihei's spy and the young lovers have to flee. Suspected of having treasonous intentions against the throne, Michizane is exiled to northern Kyushu. Determined to take revenge on Minister Shihei for plotting the downfall of Michizane, one day Umeomaru and Sakuramaru try to attack and kill Shihei on his visit to the Yoshida Shrine, but they are blocked by their own brother Matsuomaru, Shihei's servant, and forced to retreat. The sibling feud continues when the three brothers are invited back to their father Shiratayu's house for his 70th birthday. When Umeomaru and Matsuomaru finally arrive in Shiratayu's absence, they resume their quarrel, and while wrestling in the garden, fall against the cherry tree. Shiratayu finds the broken cherry tree on his return and has a premonition of the imminent death of Sakuramaru. The old man then disowns Matsuomaru because he works for Shihei and dismisses Umeomaru. 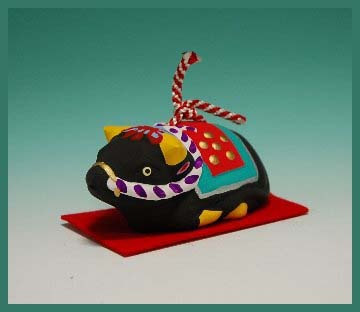 When the two brothers depart, Sakuramaru appears from inside the house wearing a black kimono, in a style far too graceful for his position as an oxherd. He has resolved to commit seppuku as a way of taking responsibility for being the cause of Michizane's exile. Sakuramaru stabs himself with a dagger, which has been handed to him by his father. As he expires, the old man beats a hand bell madly, to help his son die in peace.
. - Yamaguchi Sodoo, Sodô 山口素堂 Yamaguchi Sodo - .
. Arima Tenjinsha 有馬天神社 .
. Umezono Migawari Tenmangu Shrine 梅園身代り天満宮 .
. Tenjin Sama 天神さま a popular folk toy . every morning . . .
. Oosu Kannon 大須観音 Osu Kannon Nagoya .
. Tono Jisha Meguri　遠野寺社巡り　temples and shrines in Tono, Iwate .
. - yookai, yōkai 妖怪 Yokai ghosts and monsters - Introduction - . The flowering plums/apricot(ume) poem and the many such trees found at the Tenman shrines are attributed to the famous waka and the flying ume separately introduced here. I was under the impression that the legend of the plum flying to Michizane as a result of writing that poem (waka are sometimes attributed an effect roughly analogous to that of miracles in Christianity)and are what made the poem famous. Without the legend/miracle, it is possible the ume would have been planted to placate the spirit of this ume-lover, but as the miracle proved the depth of his feeling for the plant,unless the mass-plantings were introduced before the legend, we need to have that flying plum given more attention. I hope a Michizane scholar can comment on this comment. In the year 901, when Michizane was about to be murdered at the 筑後川 Chikugogawa river, the general of the regional Kappa 河童の大将 streched out his arm to help him, but his hand was cut off. Or maybe the Kappa had come out to pull his horse into the water and Michizane himself cut off his arm. Sanbo Taro is maybe a descendant of 菅原道真 Sugawara no Michizane. Some legends say that a descendant named 菅原実兼 / 真兼 Sugawara Masatomo. It seems he was a real person, member of one of the seven branches of the Mimasaka Kan clan - 美作菅家七流. So to appease his soul the shrine 新田神社 Nitta Jinja was erected. A goryo in Edo ! he is believed to have been born sometime around when Sugawara no Michizane died. A Meiji period biography of Taira no Masakado suggests that he may have been Sugawara no Michizane’s reincarnation; his revolt against the emperor may actually have been a continuation of Michizane’s curse.
. Yushima Tenjin 湯島天神 . There is a statue of 千手観音 Kannon with 1000 arms made by 菅原道真 Sugawara no Michizane, while he was in exile in Dazaifu. Now in a special Kannon Hall in the compound. The deity in residence is Sugawara no Michizane, hence the name Tenman-gu　天満宮. The history of Hirakawa Tenmangu Shrine starts with Ota Dokan (1432-1486), the poet-warrior-monk tasked with designing and building Edo Castle (today's Imperial Palace Tokyo). Ota is said to have had a dream about the Heian era scholar, Sugawara no Michizane (845-903), who is venerated as a deity in Japan. Then the very next day, he happened to be presented with a scroll of one of Sugawara's works. Taking these as a sign, he established a shrine to Sugawara no Michizane on the northern edge of the castle, not far from the Hirakawamon Gate, which he planted with Chinese plum trees - what is today's Bairinzaka (梅林坂 Plum Tree Slope). Yabo Tenman-gū claims to be the oldest Shinto shrine in the Kantō region dedicated to Tenjin, the deified Sugawara no Michizane, having been built in 903 AD by Michizane’s third son.